Located towards the western end of the Algarve, Portimão is one of the largest towns on this coast with a population approaching 40,000. As a tourist destination in its own right the town doesn't really jump out, as with much of south and west Portugal it was extensively damaged in the great earthquake of 1755. 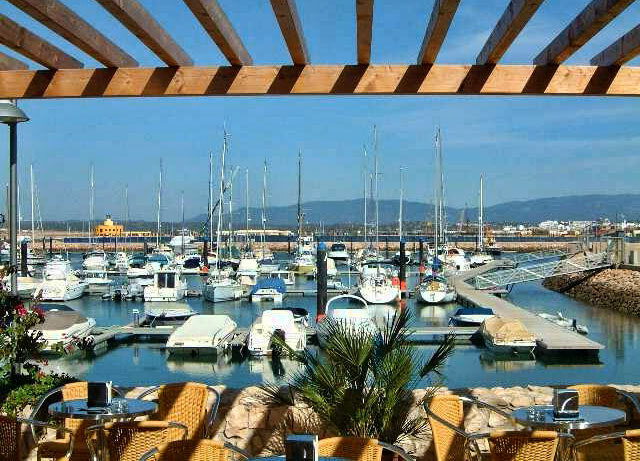 Set on the Rio Arade estuary Portimão's economy has been dependent on fishing and its growth as a port since it was founded. The Greeks, Phoenicians and Carthaginians where all early trading partners before the Moorish occupation in the 11th century and the port flourished. The Rio Arade also provided sea access to the town of Silves, the then capital of the Algarve, several Km inland. It was only in 1924 that the city and became known as Portimão. Previously it had been named Burj Munt and Porcimunt by the Moors and was then known as Vila Nova de Portimão. Present day Portimao reflects its commercial roots. Up until the 1980's the town had a large fishing and fish processing industry, this however was hit by recession and was largely replaced by the construction industry as the Algarve tourism boom took off. The town still has a large port, some rather charmless civic buildings and plenty of shopping. Perhaps the most attractive part of the town is the riverfront which runs from the marina to beyond the road bridge. There are several squares along this stretch which become increasingly less touristy as you head away from the marina. One of the few historic highlights of Portimão is the Igreja da Nossa Senhora da Conceição (Igreja Matriz de Portimão) located just to the north of the town centre. Dating back to the 14th century very little of the original church survived the 1755 earthquake with the exception of an impressive Maueline doorway. The immediate area of the church also retains some charm with little shops selling traditional lace, ceramics, leather goods and baskets. In terms of shops and markets there is a pretty good selection. For a bit of retail therapy there is the out of town Portimao Retail Park along with the nearby, newer Portimão Retail Centre. In the town itself there are a number of shops centred on the pedestrianized streets of Rua Diogo Tomé and Rua da Portades da São João. Portimão Market on Avenida São João de Deus is a great place for buying fresh food with fish, seafood and farm produce all available. Of course Portimão is probably best known for the fantastic beach of Praia da Rocha. Located about 2 miles (3km) south of the town this is one of the most impressive stretches of sand on the Algarve coast. At the eastern end of the beach are the remains of a17th century sea fort - Forte da Santa Catarina, the terraces of which offer a great view over the beach below and the river to the other side.